An Israeli artist has created a shocking and disturbing project that exposes thoughtless selfie takers posing in front of a Holocaust memorial in Berlin. The Holocaust Memorial in Berlin is a popular tourist attraction for visitors to the city. Although it’s meant to signify the death of six million Jews that were killed during the Second World War, many tourists appear to be entirely ignorant of the poignant meaning of the memorial, and instead use it as a backdrop for “fun” selfies. The tourists’ ignorance provided satirist Shahak Shapira with ample material to work with for his haunting Yolocaust project, which he sourced using social media sites. 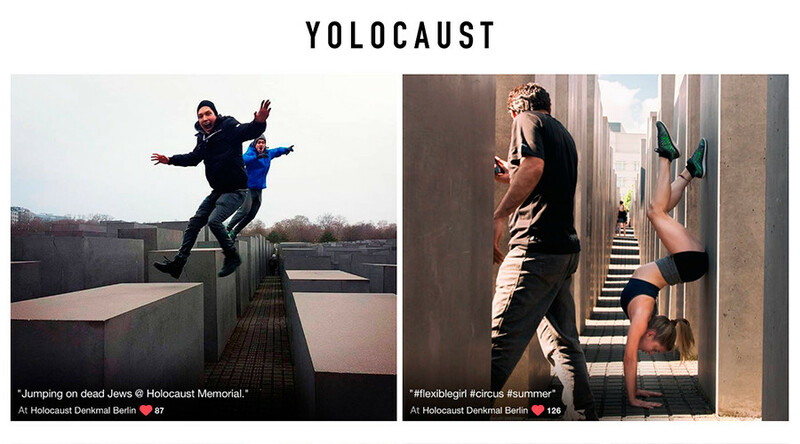 In a series of disturbing images, visitors to the Yolocaust website can see the selfie-takers posing in front of the Memorial, and then hover over the image to see them striking the same pose with a background of actual imagery from the Holocaust taken at German extermination camps. Ok, now for something even beyond anything we'd ever dream up. The selfie-lovers’ silly poses jar against the sombre and disturbing images from the war, providing a sharp contrast from which to view the idea of getting that “perfect” shot next to such a meaningful memorial. Shapira has given thoughtless tourists featured in the series, the chance to have them removed, by emailing undouch.me@yolocaust.de.